Kintsugi – or kintsukuroi – is a Japanese method for repairing broken ceramics with a lacquer dusted or mixed with gold, silver or platinum. The technique visibly incorporates the repair into a new piece instead of concealing it, the process resulting in something different, and usually more beautiful, than the original. The method is based on the philosophy of kintsugi which regards breakage and repair as part of the history and inherent value of an object, something to be highlighted rather than disguised. Rather than repairing something to be and to appear as good as new, as we most often do in Western culture, kintsugi acknowledges the breakage as an opportunity to create something new and beautiful from what might otherwise be deemed a loss or catastrophe. I first learned about kintsugi while listening to an interview on CBC about the release of an album of the same name by the band, Death Cab for Cutie. As I listened to the musician’s explanation of how kintsugi transformed a broken object into something more beautiful, I thought about the ways in which the philosophy pertained to the way in which I approach my practice as a psychotherapist. The individuals that I work with most often seek assistance at a time in their lives when something is perceived as broken or no longer working as it once had, be it an external circumstance such as an unhappy relationship or doing poorly at school, and/or an internal struggle with regard to self-esteem, persistent negative emotions, and very often the dysfunctional manner in which he or she is coping. This is manifested among many of my clients through disordered eating, substance abuse and/or some other self-harming behaviour. I believe that we develop these behaviours for very good reasons, helping us to cope and to find relief from the stress and pain of our life circumstances. While anything but easy to replace those behaviours with less shame-based and more healthy and functional coping strategies, it can and does happen. However, as one makes changes in him or herself, and develops new ways of being in the world, as with the art of kintsugi, one evolves as different and in my view, more beautiful in light of honouring both the person’s past experience as well as his or her transitioned new self. That said, it is not uncommon for others, and in particular for partners and family members (but also friends and colleagues), to themselves wrestle with adapting to the changes in the person and to come to fully appreciate the more confident, authentic and no longer [so called] broken individual. Those who pursue therapy are usually motivated to at least some degree to want change, the status quo no longer being comfortable or even bearable. However, as happy and relieved as others may be with regard to the positive changes in their friend or loved one (e.g., recovery from an eating disorder, addiction or better coping with anxiety), it may still be an adjustment to fully embrace the new dynamics of their relationship with a person who may be, among other things, more assertive with regard to their wants and needs. Hence, the relationships of my clients also often experience some degree of transition; while the new dynamic may be different, it is also usually more healthy, authentic, stronger and happier. I encourage my clients to embrace their history, including their challenges, as inherent to the person they have become and the person they would like to be. It is the frequently the very breaks and knocks, to which we are all susceptible in our lives, that help us to develop more resilience, self-assurance, strength and authenticity. 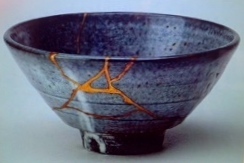 While I would never wish anyone any adversity, I have repeatedly witnessed in both my own life and in the lives of those with whom I have worked, much like the ceramic pieces repaired with kintsugi, that we can emerge as different but better, through the very process of overcoming these life obstacles. Flickwerk The Aesthetics of Mended Japanese Ceramics, Paperback, January 1, 2008 by Christy, James Henry Holland and Charly Iten Bartlett. Kintsugi is the eighth studio album by American indie rock band Death Cab for Cutie, released on March 31, 2015, on Atlantic Records.